Slushies are the most popular food on the market during the Altador Cup season. Originally just a cold treat sold in Happy Valley to make cold neopets even colder, the slushie market has expanded tremendously since the discovery of Altador. The blazing heat during the month of relaxing was always a problem in the past, but since they discovered slushies, that hasn't been as much of a problem. You can find slushies on nearly every street corner during the Altador Cup in nearly a hundred different flavours. But did you know that every team has their own signature slushie flavour? Now you can support your favorite team even more by enjoying their official slushie! But what flavour supports your favorite team? I'm so very glad you asked. This slushie is one of the three slushies served in the game Slushie Slinger, and this is why. It's the official slushie of Team Altador. This cold green and yellow slushie is absolutely perfect on a hot summer day, and it tastes good too. Made with real zeenanas, this slushie is a frosty treat that you won't want to pass up on. Grenelons are believed to increase the wisdom of anyone who eats them. That's mostly legend, as there are only two recorded cases where that has ever happened, and both of those have been passed off as an increase in studying. However, the grenelon is still exceedingly delicious and Brightvale citizens eat them by the ton. This unique slushie is made with freshly squeezed juice from three grenelons to ensure maximum flavouring, and it is eaten by Brightvale fans everywhere. Goodness knows how this slushie is made. It is truly amazing, how the slushie actually looks like it has been painted with cloud paintbrush. Maybe that is how they do it, I don't know. The shopkeeper of Happy Valley's Slushie Shop refuses to comment on how it's done, probably to prevent rival competition from making the same slushie. However this slushie has a rather watery taste, as most of the appeal is in the appearance of the slushie. Faerieland no longer resides in the clouds, but this slushie is still just as popular as ever amongst Faerieland followers. While this slushie may not be the best tasting on the market, it certainly captures the spirit of the Haunted Woods team. As you can see, there are lots of cute wriggly worms inside, burrowing through the dirt. Whether or not that is real dirt and real worms, I am not sure, but they certainly do taste like them. However, this is a common theme with spooky food, and everyone knows that spooky food comes from the Haunted Woods. This slushie certainly represents its land well, or so the Meepits tell me. Okay, this one is just a joke. We all know that Jelly World doesn't really exist. If it did, why would they want to miss out on the Altador Cup? Mmmm.... this zingy slushie contains raisins, hazelnuts, bananas, apples, coconuts, and fresh juppies to create a refreshing blend that really expresses the laid back and fun personality of Kiko Lake. Kiko Lake is well known for its fine food, and I love their fudge. I seriously can't get enough of it, it's so rich and creamy and... sorry, getting off subject. The point is, there is good food with tastes unlike anywhere else in Neopia. This unusual slushie really tastes like Kiko Lake, and any true follower of the team will proudly agree. What are those blue and pink layers, you may ask? They are layers of raspberry and charroberry, making this slushy a surprisingly tangy yet sweet treat. It's not your everyday combination, but Krawk Island is hardly your everyday island. It's one thrilling swashbuckling adventure after another, followed by dinner at The Golden Dubloon. I'm not sure why the team chose this as their official slushie, as neither of the ingredients are grown on the island, but maybe if you try it you can figure it out. It tastes great! This is quite possibly one of the most unique slushies chosen by a team, as it is actually made from baby planets, or so they say. Personally, I suspect that the primary ingredient in this slushie is the voidberry, but once again, the shopkeeper of Happy Valley's Slushie Shop refuses to comment. This slushie is imported directly from Grundos on Kreludor and are considered a delicacy by the team members. This slushie is one of the most expensive of the slushies, mainly because it is a gourmet treat, and Grundos like to take a percentage of the profits. You know, for shipping expenses. You've probably all had kelp before- hasn't everyone? In soups, salads, and even breads; why not slushies? This unusual slushie has been endorsed by Maraquans everywhere, since kelp is a staple for our friends under the sea. This refreshing blend of kelp and slushie is great for anyone who enjoys aquatic cuisine, and even for those who don't. I realize that some slushies, like the Tangy Tropic Slushie and the Zeenana Slushie, may sound more appealing then one made from kelp, but I can assure you that this slushie is every bit as tasty. It's even vegetarian, so it's hard to complain with a slushie like that, right? Why not give it a try this season if you haven't already? Twenty-seven percent of the profits go to supporting Team Maraqua, so even if you don't like the idea, you should take one for the team! Chokato, a combination of chocolate and tomato, is quite a popular flavor in Meridell right now. There are a number of chokato-growing contests throughout the land, and it's very exciting for the farming community. Within the past few years, one farmer grew a chokato fruit that was roughly three times the size as the marrow from the Guess the Weight game. 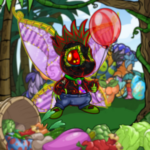 He sold it for several hundred thousand neopoints to a wealthy slushie maker, and they have been enjoying the sweet taste of chokato slushies ever since. It's quite a traditional treat now, especially during the month of Relaxing, and nearly every supporter of their team will be enjoying them this season. This is the official slushie of Moltara solely because it's the only slushie that can sit in Moltara without evaporating on the spot. This slushie can be served at any temperature the consumer wants, and it honestly is tasty at every temperature, if a bit bland. I would recommend stopping at Molten Morsels and picking up a little fried ginger or fire rice to add some additional flavour to it. Everything about Mystery Island has to be a mystery, doesn't it? I can't even begin to identify what kind of berry this is. I spoke to a friend who specializes in berries, and they don't know what kind it is either. They suspect that it is actually a mix of several different kinds of berries so that no one will ever be able to pick out the slushie recipe by tasting it. Not a bad idea for marketing either. However, I still have hopes that some undiscovered culinary genius from some corner of Neopia will be able to figure it out. Why don't you give it a try? Roo Island is a cheerful little island located on the other side of the rainbow... what better slushie is there to represent that? This cheerful little slushie is made with the very essence of that rainbow mixed with crushed ice. There is so much flavor in it that it is practically bouncing around with excitement, calling out "Try me! Try me! Try me!" This colourful slushie is something you should never underestimate. Ice and mint... two very refreshing ingredients. Shenkuu is known for its refreshing cuisine. Everything from mint rolls and green tea custard to a river wave breeze, this land is known for exotically refreshing food. The icy mint slushie will certainly cool you off and rejuvenate you after a long, hard day of playing yooyuball. Even if you aren't a Shenkuu supporter, I would recommend trying this delicious slushie. Nothing cools you off faster, except for perhaps a snowflake slushie. Though most slushies can be made at an Altadorian slushie bar, these are made strictly in Terror Mountain, the main ingredient being Happy Valley snow. If you use snow from anywhere else, your snowflake slushie is reduced to just a snow slushie, and those aren't nearly as good. Though most people say that there isn't a taste difference, they haven't had enough of both. Snowflake slushies have a slightly crisper, cooler, and more frozen taste then any other slushie on the market, and any true slushie connoisseur can tell the difference. This signature slushie does come with a slightly higher price when sold in Altador, due to the extensive shipping process, but it truly is worth it for its frosty flavour. This slushie simply has to be Tyrannian. Who else would use stones and slime in a slushie? The answer is of course, no one. This recipe was developed by a Tyrannian chef, and is surprisingly tasty when served with the correct consistency. It is a slushie that should not be underestimated because of its somewhat gross appearance. Be bold and give it a try sometime. You won't be disappointed. Tchea fruits are good in so many things. They're good in pasties, pastries, and pies as well as soups and toasties with Tchea and Meatball Noodles. It even has it's own ice cream flavor, and tchea tastes great with blue cheese. They also taste good either plain or roasted. Why not try it in a slushie? This popular yet slightly mixed up Lost Desert fruit has spread all across Neopian and is served in so many different ways. It's one of the most famous fruits out there, famous for its strange coloration and flavour palate, where the blue bits taste like banana and the yellow bits taste like blueberries. It only makes sense for this to be the official slushie for the Lost Desert team. The team actually eats a large number of these slushies, since it's so hot in the Lost Desert. It's hot in Altador too, which is all the reason you need to purchase one of the tantalizing treats! All hail the victorious and virtuous leader of the Space Station with this... erm... slushie. No one knows for sure what's in it, but it's a gourmet food, which means that it must be good, right? It seems to be very popular right now on the Space Station. Everyone has them, and they are sold around nearly every corner.